Years ago, I worked with a WWII veteran who was stationed at Coronado Island in California. 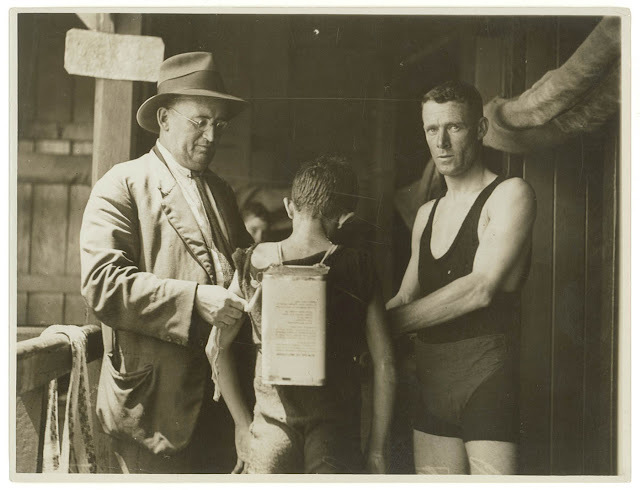 He was responsible for training the new recruits in basic water safety before they shipped out. 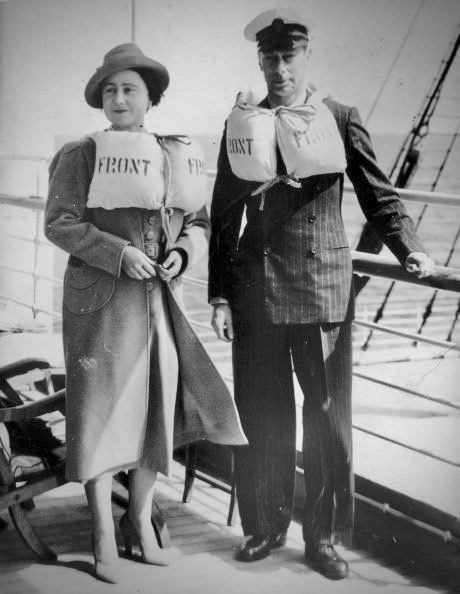 According to him, the most important directive to remember was how to hold the life vest when jumping off the deck of a ship. 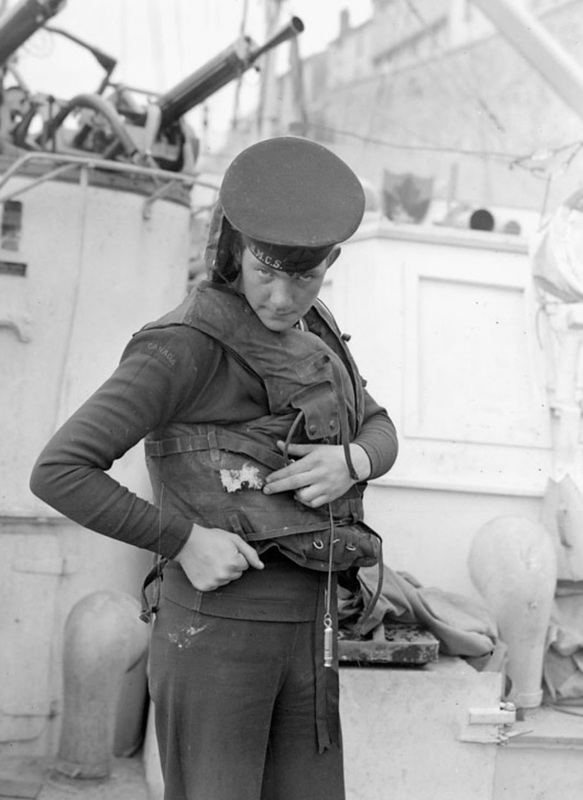 Royal Canadian Navy Seaman points out a bullet hole in his life jacket. 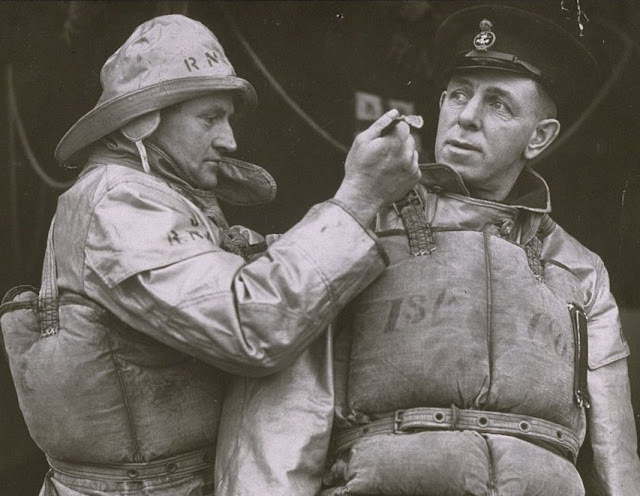 The vest would jam upwards when the soldier hit the water and GI's jaw would snap back, knocking him unconscious and possibly breaking his jaw. I should have guessed that preventing military safety equipment from becoming lethal was a concern. In 1765, Dr. John Wilkinson patented the first life jacket using sections of cord adhered to a fabric base. In his book Seaman's Preservation from Shipwreck, Diseases, and Other Calamities Incident to Mariners, Dr. Wilkinson estimated 4,200 British sailors drowned each year. 1,000 of them "may be saved from thus perishing with the greatest ease and certainty at a charge not worth notice". Someone needs to write a series, Preservation from Disasters, Diseases, and Other Calamities Incident to . . .
America's Preservation from Disasters, Diseases, and Other Calamities Incident to Voters. 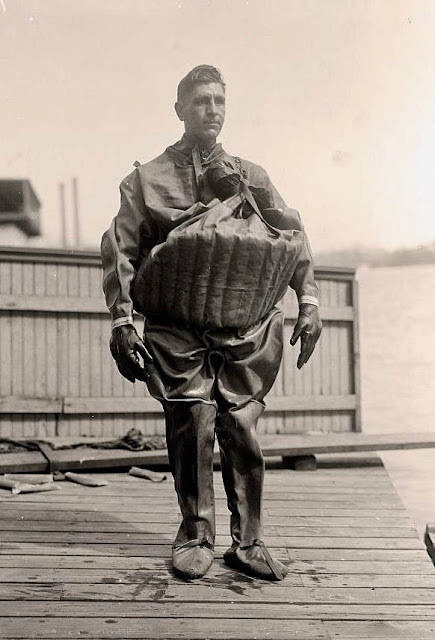 Sailors were not issued floatation devices, cork or otherwise, until decades after the cork jacket was invented. Large navies, and by large navies I mean the British Royal Navy, needed a constant supply of cannon fodder, and young men were "pressed" into services. Impressment was less military draft and more along the lines of abduction. Demonstrating using a tin container as a floatation device while learning to swim. 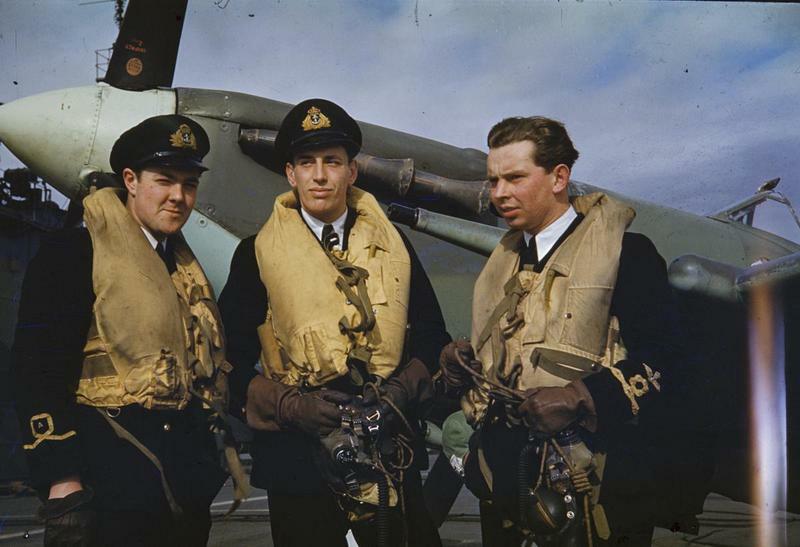 The concern of the Royal Navy was the mistreated lads may jump ship if they had some hope of not drowning. An inspector for the Royal National Lifeboat Institution, Captain John Ward, designed commercially viable cork vest in 1854. 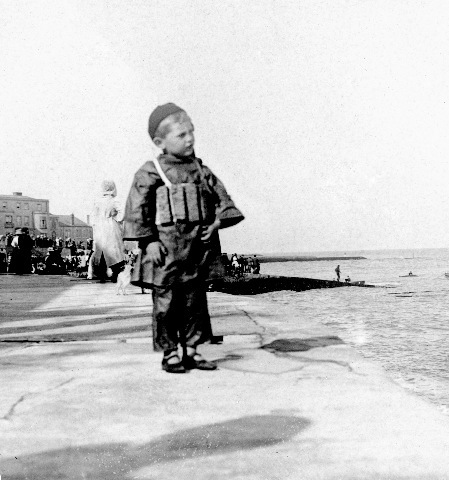 The Royal National Lifeboat Institution sold chests of life jackets at a very low price to encourage their use. 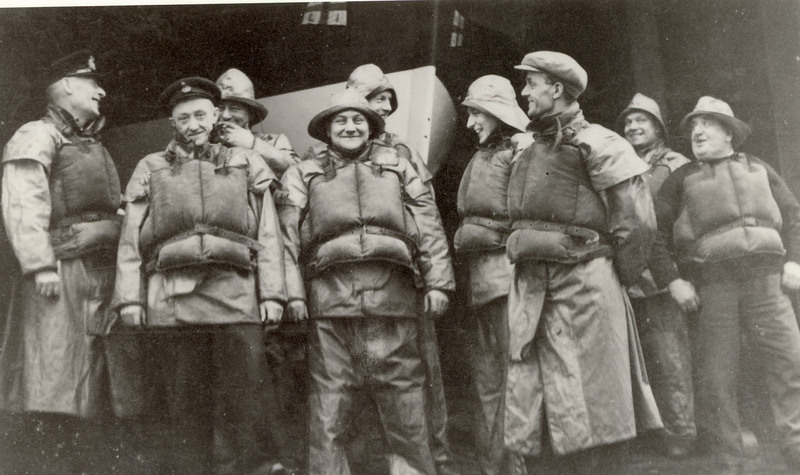 They became the standard for safety after a tragic lifeboat incident. The entire crew drowned except for Henry Freeman who was wearing his jacket. 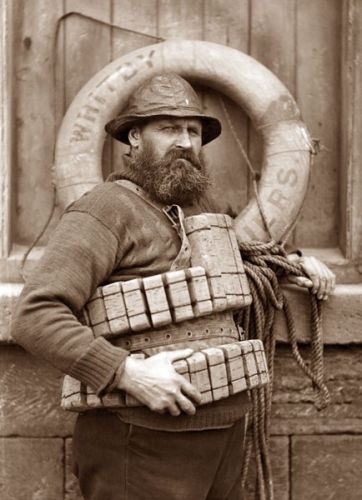 The U.S. Congress passed a law requiring ships to carry life preservers. 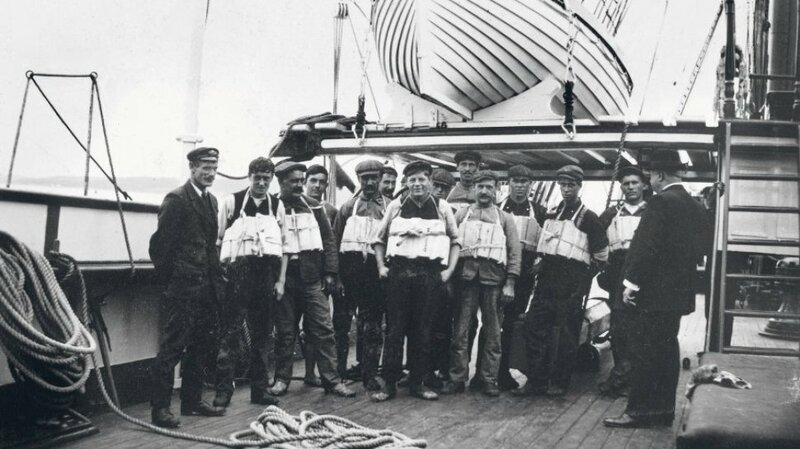 A small portion of the Titanic crew participating in a lifeboat drill and inspection of lifejackets. The Titanic was equipped with 3,560 cork jackets and icy corpses were retrieved floating face down. Crew of the Princess Royal wearing kapok lifejackets. 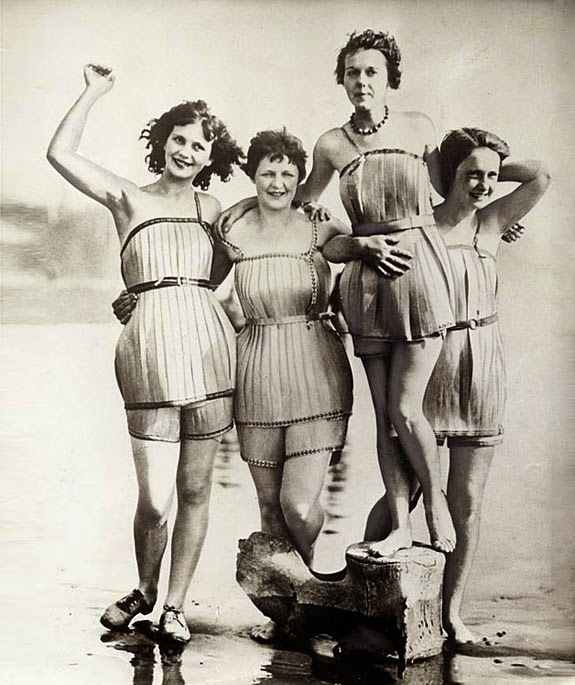 In the early 1900's life preservers were filled with kapok, a fibrous seed floss that grows on a tropical tree. The Universal Safety Mattress Co advertised their Universal IIanasilk Life Preservers claiming the kapok filled mattresses and pillows, should the need arise, might keep the owner buoyant. 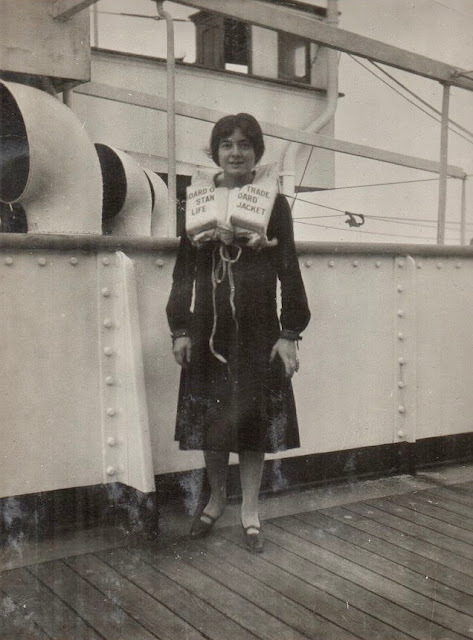 An early attempt at an inflatable life preserver. During WWII, Japan cut off America's supply of kapok. 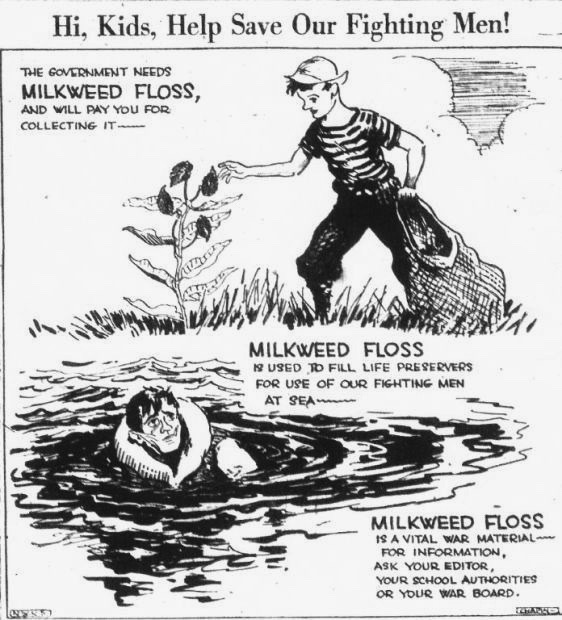 Milkweed floss was used as a substitute. A call for children to gather milkweed. Two sacks of weed floss were needed to create one floatation device. Approximately 11 million pounds were collected during the war. There were several problems with the plant fiber including flammability, rotting over time, and the loss of buoyancy when submerged for long periods of time. Manufactured foam replaced natural fibers when it became available. Improvised floatation devices made out of bike tires. 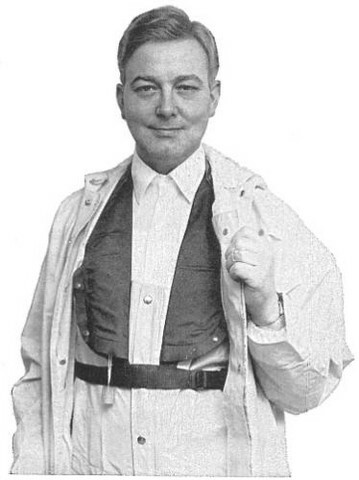 Peter Markus developed an inflatable vest in the 1920's. 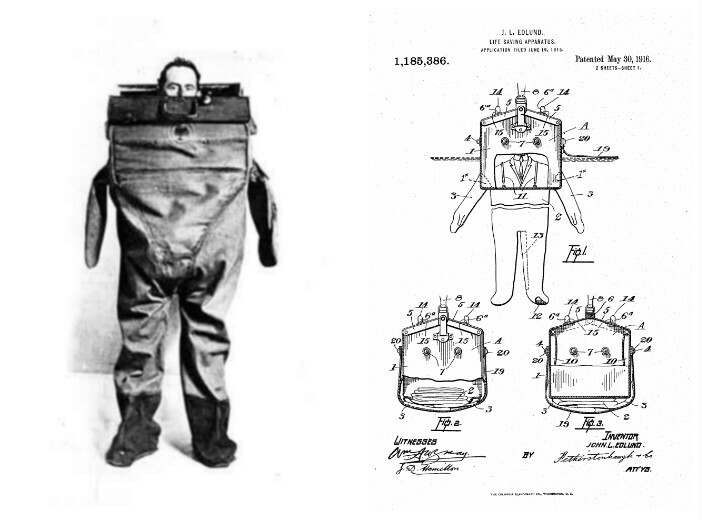 The pockets on either side of the chest would fill with fluid carbon dioxide when a cord was pulled. In the 1930's, a dirigible crashed into the Pacific Ocean. The crew of 100 were wearing their life vests and 98 were saved. 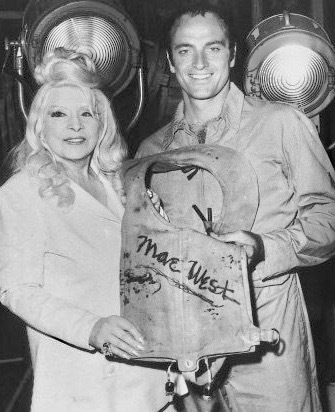 During WII, the GIs called the vest "The Mae West". When inflated, the pouches resembled the actresses cleavage. When Mae West wrote a letter to the service men who originated the moniker. I have just seen that RAF flyers have a life-saving jacket they call a "Mae West" because it bulges in all the "right places." Well, I consider it a swell honor to have such great guys wrapped up in me, know what I mean? C. A. Robertson, the Chief Draftsman for a large manufacturer of air-sea recuse equipment, started the goldfish club in 1942. 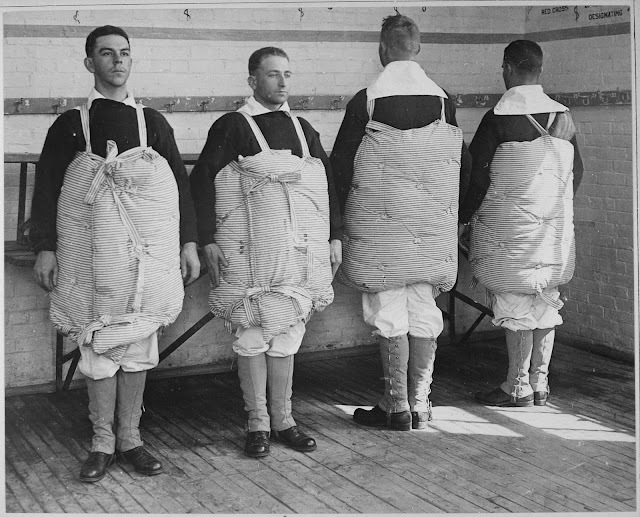 Service members qualified if they were forced to parachuted into the ocean and were saved by a flotation device. 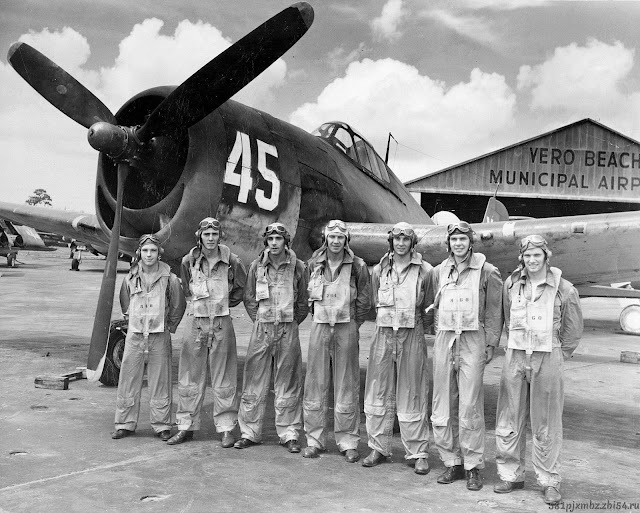 9,000 members from the Allied forces had joined by the end of WWII. to keep alive the spirit of comradeship arising from the mutual experience of members surviving, "coming down in the drink". 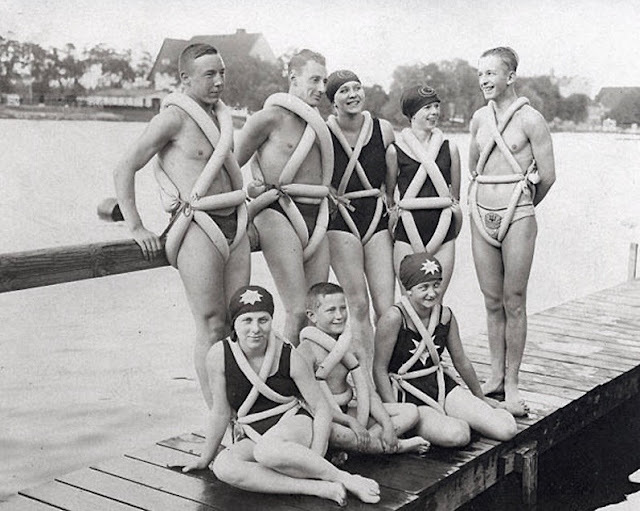 The BS 8 life preserver was designed by Jost Bernhardt in the late sixties, bringing both dapper and functional to water safety options. The design involved a water soluble, cellulose capsule which dissolves when wet. A pin was automatically released which punctured the carbon dioxide cartridges. The design activated even if the person wearing the life preserver was unconscious. 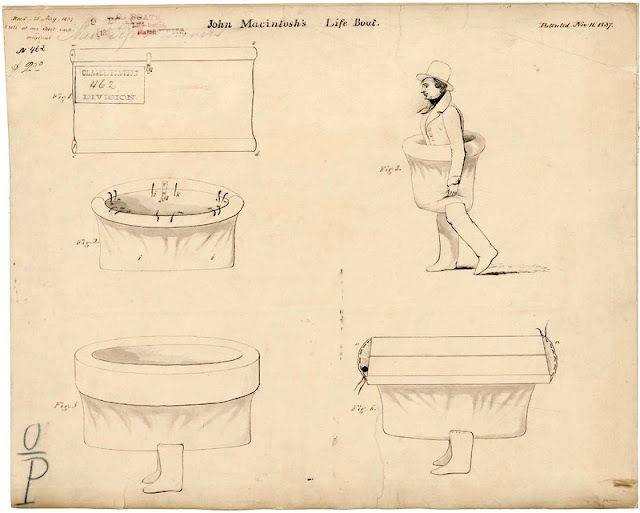 The wearable lifeboat was designed in 1837, the theory being the canvas, rubber coated tub would stay afloat using non-collapsible air chambers. The inventor suggested, "Oars, or paddles, be used to give a direction to such vessels". A Norwegian sailor, who had been shipwrecked three times, invented a life saving valise after Titanic disaster. 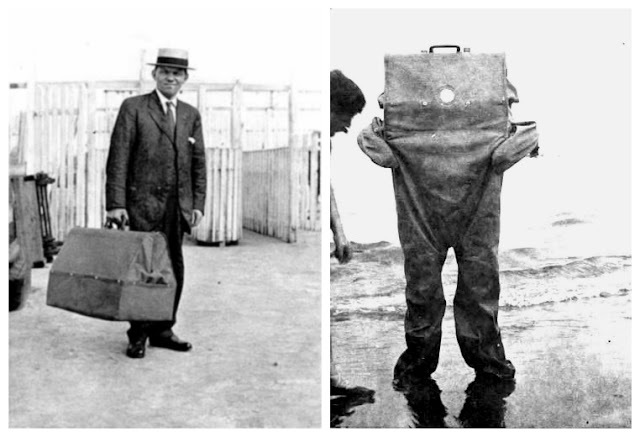 When unfolded, the passenger would climb into the suit and walk into the water from the ship’s deck. The valise included a small glass window. Genius!